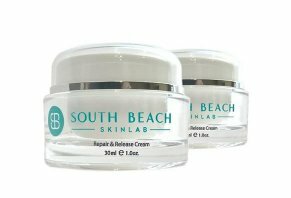 Release & Repair Cream by South Beach Skin Lab Reviews - Is it a Scam or Legit? Formulated by Dr. Ryan Shelton to boost skin’s elasticity and plumpness, the Repair & Release Cream by South Beach Skin Lab claims to be the only anti-aging product you’ll need. Formulated with seven of the most powerful moisturizers available, along with peptides like Matrixyl 3000 and Argireline NP, the Repair & Release Cream by South Beach Skin Lab promises to help support your skin’s natural ability to fight aging, increase elasticity and plumpness, and leave you with confident, beautiful results. The company tells us their flagship product was formulated by Dr. Ryan Shelton “to be the only daily cream you need in your beauty cabinet” without having to spend a fortune. It also doesn’t use ingredients like parabens or silicone, and isn’t tested on animals. Simply apply a dime-sized portion to your face and neck day and night, and it will go to work on stubborn areas like crows feet, sagging skin, lip lines, and brow furrows. The formula is safe for use regardless of your skin type, age, or other products you use. Even if you just started researching anti-aging and related beauty products, you know they all make different claims. But, can you realistically expect South Beach Skin Lab’s Repair & Release Cream to deliver the best bang for your buck? Will it help you be the best version of you, as claimed on their website? Give us a few minutes of your time, and we'll help you make a more informed purchase. While some fare better than others, all of us eventually experience common signs of aging like sagging skin, under eye bags, fine lines and wrinkles, a dull complexion, and crepey skin. What causes this? Basically, two of the most common proteins in your skin are collagen (it provides an underlying framework, like the 2x4s supporting your house) and elastin, which works like a spring to provide elasticity. In our early years, our body produces plenty of these proteins, which, among other things, means that our skin is firm and radiant. As we get older though, our body produces increasingly less, leading to the signs of aging mentioned above. Given these basics, is there anything contained in South Beach Skin Lab’s Release & Repair Cream that can boost collagen and elastin production, or otherwise address signs of aging? Like the vast majority of anti-aging creams, sites like Truth in Aging, Paula’s Choice, and EWG.org report that most of Repair & Release Cream’s ingredients act as emulsifiers, emollients, moisturizers, solvents, fragrances, and preservatives. In other words, they help retain water against the skin, boost texture, increase shelf life, and improve aroma. However, this isn’t the case for all of Repair & Release Cream’s ingredients. For example, these same sites report the topical application of sodium hyaluronate, a form of hyaluronic acid, may help improve cell turnover and boost moisturization. Similar to a topical version of Botox, dipeptide diaminobutyroyl benzylamide is a synthetic neuropeptide (trade name Syn-Ake) that causes facial muscles to relax, thereby temporarily preventing the appearance of wrinkles. Acetyl Hexapeptide-8 (trade name Argireline) is thought to work in much the same way, while Matrixyl 3000 may help boost collagen production. Finally, the small amount of natural caffeine found in green tea may also help temporarily firm skin, although not as much as any of the peptides above. Could Repair & Release Cream’s Ingredients Cause Side Effects? These same sites report the most common side effect associated with these ingredients is mild, temporary redness or irritation at the application site (no dosages or other specifics provided). This could especially be the case if you have sensitive skin. Truth in Aging indicates there’s some concern that the continued use of Argireline could lead to skin sagging, although they emphasize that this is “theoretical,” with no existing clinical support. For these reasons, you’ll want to speak with your dermatologist before using any new skincare product, Repair & Release Cream or otherwise. How Much Does Repair & Release Cream Cost? Regardless of the amount you purchase, all orders come with a 60-day money back guarantee, less S&H. In order to request one, customer support can be reached at 877-557-6349, info@southbeachskinlab.com, or live chat via their website. What Can We Learn From Repair & Release Cream Customer Reviews? Since writing our original article, 10 HighYa readers have provided their feedback regarding South Beach Skin Lab’s Repair & Release Cream, giving it an average rating of 3.9 stars. Compliments often revolved around effectiveness (reduced signs of aging) and attractive packaging, while complaints (what relatively few there were) frequently referenced no results. On the South Beach Skin Lab website, 58 verified customers had given the cream a slightly higher average rating of about 4.4 stars, with many of the same compliments and complaints. South Beach Skin Labs is based out of Miami, FL. The product line was formulated by Dr. Ryan Shelton, a Double Board Certified Naturopathic Doctor who earned his master’s degree at the University of Kansas, and received his doctor's training at Bastyr University in Kenmore, WA. In 19 Cardinal Rules for Wrinkle Prevention, we outline that, while genetics can certainly play a big role in the formation of wrinkles, preventing them from occurring in the first place is largely a matter of lifestyle habits. In other words, wearing sunscreen and sunglasses, avoiding smoking and excessive alcohol consumption, managing stress, eating a healthy diet, getting plenty of exercise, and drinking plenty of water (as just a few examples) will go a much longer way toward impacting the signs of aging than any beauty cream, lotion, or serum will. Even then, the American Academy of Dermatology points out that “sunscreen and moisturizer are the two most-effective anti-aging products you can buy,” and that “using these every day can make a noticeable difference.” From there, they recommend seeking out a product formulated to address your remaining concerns, such as wrinkles, under eye bags, crepey skin, etc. After all, “No product can treat all signs of skin aging,” they say. Once you have specific options in mind, whether Repair & Release Cream or another formula, they note you should carefully read the label and look for those that are hypoallergenic (decreased risk of causing allergies) and non-comedogenic (doesn’t cause acne). Finally, they note you should maintain realistic expectations (“remember that anti-aging skin care products deliver modest results. You cannot get the results of a facelift from a cream”), and keep in mind that paying more doesn’t necessarily mean you’ll get better results. According to sites like Truth in Aging, Paula’s Choice, and EWG.org, it certainly seems feasible that some of the ingredients (mostly the peptides) contained in Release & Repair Cream could help temporarily reduce the appearance of fine lines and wrinkles. However, it’s important to balance this by pointing out that, based on how common these ingredients are in other anti-aging creams and serums, their formulation doesn’t appear to be anything revolutionary. Pro tip: Additionally, based on our research, we’ve learned that over-the-counter creams often don’t provide the same benefits on crepey skin as they do on wrinkles. So, even if Release & Repair Cream delivers on its promises of reduced wrinkle visibility, you might not expect the same for your crepey skin. In the end, though, finding a skincare product that meets your needs and preferences is a highly personal decision, so what works fantastically for one person might be a total flop for someone else. For this reason alone, we think it’s positive that South Beach Skin Lab backs Repair & Release Cream with a 60-day refund policy, which should be more than enough time to decide if it’s the right option for you. The formula also comes from a company who has a mostly positive online customer reputation, which could go a long way toward indicating what you might expect after handing over your hard-earned money. Just keep in mind that if you’re dissatisfied with Repair & Release Cream’s performance, you’ll have to pay a minimal fee (depending on where you live, of course) to ship it back to the manufacturer. As soon as I tried to open the jar it separated from the jar. I could never try the product. I called and sent emails and no response. If a product is so poorly packaged I would be very concerned about the product itself. What do you mean when you say that "it separated from the jar?" At first, I was skeptical because I have purchased probably over 100 different anti-wrinkle and skin care regimens without noticing any difference. I got about half way through the cream and realized my face felt and looked so much better that I am ordering more. Ladies, this one REALLY WORKS! I listened to the video and thought what the heck, I'll give it a try. Even though they say it's not expensive, I thought it was. I used it faithfully, in the morning and again before bed, just as recommended. I have a few facial lines, but my biggest embarrassment is the crepey skin on my neck and the lines in my decollete area. I used the whole jar almost exclusively on my neck and decollete area, and there was absolutely NO CHANGE in the appearance. Big disappointment. The only thing it did was moisturize. The video really made me hopeful, but I should have known better. Oh Susanna! (Sorry, couldn’t help myself. LOL) I completely agree with your comment about him saying that it’s not expensive. “It’s so dirt cheap, it might as well be free” but $39.99 is far from cheap or free! Or how about “the average woman spends $5,100/year or $412/mo.” I’m pretty sure you’ll agree we haven’t met these “average women!” They must live in a parallel universe. Good grief! The video was pretty convincing, but with a history of researching before I buy, I found sites like this that set me straight, again! Thanks for your review. I’m sorry he sucked you in. I'd like to suggest a product to you, it's called Epionce, for your dry or crepey skin. My dermatologist convinced me to try it since I am very chemically sensitive due to long Lyme history, however, still being very skeptical about trying new stuff. Her office charged $65 when I first bought it about 4 years ago, but now I get it on Amazon for less, (between $46 and $55). It is so soothing, almost elegant. Anyway, the South Beach route might help temporarily, but it's still relatively expensive an 8 oz. tube of Epionce lasts me about 7 months to a year. Ryan is selling 30 ml. (tiny amount) for between $40 to $60. That is still a lot of money for one month. I will go find peptides and drink them if I needed to. I recently purchased three bottles of this cream, being hopeful, but not convinced, that it would help reduce some wrinkles and improve the loss of elastin in my 50-year-old face. Due to health issues, I haven’t aged well, so I was hoping to slow down any more damage. The Pros: The product arrived quickly, and was packaged well. It is similar in packaging to other high-end products. The ingredients are not listed on the bottle, BUT they are listed on each individual box that the bottle comes in. This is nice because it gives the bottles a classy yet minimalistic look on my bathroom counter and bedside table. The product has a very light scent that is non-obtrusive to the senses. From the very first use, I noticed a tightening and plumping of the skin within minutes of use, which did, in fact, make my skin look younger and less wrinkled. My under-eye skin especially saw positive results from this cream, as it has almost no elastin or collagen and tends to “gather into wrinkles and stay there” if I rub my eyes. The effect of the cream counteracted this, and my under-eyes looked much younger from the application of it. The Cons: I put one bottle on my nightstand and one on my bathroom sink, so I would remember to use the cream twice each day. The first thing I noticed was that one bottle was thick and almost waxy or “coconut oil-like,” a good bit thicker than toothpaste, and the other was a lot more fluid, about the same as a tub of cold cream or Noxema, or sour cream if you don’t know those two examples. This concerned me because that means the ingredients vary from batch to batch. The next thing that I noticed was that my skin looked amazing for a short while after applying the cream, but it didn’t last. A few hours after applying the cream, my face looked like it’s old wrinkled self. I don’t wear makeup on my skin (only mascara and brow pencil), so it wasn’t something I’d added to dry my skin out. I started wondering if I could perhaps reapply the cream 4 to 6 ties day instead of only twice, but I am concerned the ingredients may not be healthy for my eyes (as it penetrates the skin around the eyes) and that is where I’d need it most. Lastly, although it doesn’t “burn” if it gets in my eyes, it does creep up, much like sunblock, if I put it around my eye area and it makes my eyes water a bit, which of course has me blotting and rubbing the area. This only adds to the aging process of that area, so I find that counter-productive. All in all, I haven’t used it long enough yet to make a determination if it truly benefits the skin or is just a temporary quick fix for when I’m going out or having my picture taken. I would recommend it for those two situations, as it works better than what my dermatologist, the mall, the drugstore, or my local supermarket has offered me so far, when it comes to “instant results.” I will try and post back again after a few months to give an update on the long-term effects. If you can get it at a great price, and want the instant, but temporary “fountain of youth” fix, I’d say go for it. If you’re looking for real healing and an actual slowing of the aging process to your facial skin, I can’t give you the thumbs up yet. Time will tell. I had dark circles and swelling under my eyes, well, I don't now! I was using the repair and release cream on my face, and I liked it so much that I ordered the eye cream it works on me. I've used every cream out there even paying as much as $65.00 per bottle, obviously, that didn't work. I ran across the South Beach repair and release cream and I was impressed. I still have a few wrinkles but my face and especially those awful dark bags under my eyes look 90 percent better. I'm going to continue to use it, my face feels better and looks better! I purchased six jars of this cream in late February of this year and began using it March. It's been almost five months now and, unfortunately, I see no difference in my skin, other than the dark circles under my eyes, which are much more noticeable now than they were previously. I was so excited to find this product, the presentation sounded so promising, but there were two small "red flags" that should have clued me in to use caution. One: the "buy more" offers that popped up as soon as I went to purchase one jar. I fell for it, and although I'd never tried this product before, I bought six jars since it was the most economical. Second: when the product arrived, the ingredients are not listed on the jars. I've never purchased anything before where the ingredients weren't on the product. This might mean nothing, but it still made me pause and wonder if what I purchased is really in the jars. I will finish using the one remaining jar I have, but then I'll be going back to my "tried and true" less expensive Olay products. Overall, this was a disappointment. I checked all my other skincare products that came in boxes and none of them have the ingredients listed on the jar. They are listed on the box the jar came in. I purchased like most, not sure if it would work. I am always trying to find something to help diminish dark splotches on my face, neck, and chest from sun damage. I am 50. I have very good skin otherwise. I have stayed away from the sun for several years, but the damage is done from years ago of too much sun. I don't have many wrinkles, but I am starting to notice lines and face looking tired. The main issue is the dark spots. The only thing that I have ever notice a difference in is to get expensive photo facials. They helped tone down the dark areas and smooth my skin, but after three years they are dark again. I decided to try this before starting a round of 3-4 photo facials. They are expensive, hurt and have to go through over a week of healing each time, but they do work. I just finished my second bottle of this product, and I have a very noticeable decrease in the color of the brown aging/sun spots. They are much lighter and my skin looks more radiant. My laugh lines seem smoother. No cream has ever faded my spots, and I have tried several. I never write reviews either but wanted to because I think it is a good product. It has good ingredients and no heavy fragrance. I can use it on and around my eyes with no irritation at all. I am very happy with the lightening of my sunspots. The website and their emails seem a bit like a scam, but the product works for me. When ordering, I decided to give it a vigilant try for the 60-day guaranteed results claim. I saw no difference but kept to the twice daily use and hoped in time it would reveal some improvement. I was so disappointed but knew in my heart that if it's too good to be true, it usually is too good to be true. I went a little over the 60 days to notify South Beach. As it turns out, it was ten days over, and I was told the terms and conditions are before 60 days you have to notify! So how can one give it a 60 day try before finally giving up and saying it does not work? You can't! They will not honor a refund after 60 days period. The product is amazing. I tried so many, and my face looks and feels great. I ordered three more bottles. You're only charged for what you order, not every month. I made a mistake ordering online and sent them an email. It was corrected the next day; the service was great. Thank you South Beach. I ordered the South Beach Skin Lab Repair and Release Cream back in December after watching Dr. Ryan's presentation. I wasn't exactly sure what to expect, but what a pleasant surprise. The shipping was fast, and the packaging really felt like other high-end creams I had bought before. I've been using it now for about 4-5 weeks, and I am noticing that my skin is feeling tighter and some of my deeper wrinkles are starting to look less pronounced. I wouldn't say that they're all gone or anything like that, but I'm hoping that with continued use, it will continue to make my skin look younger. I have to say when I ordered this product I did not think it would be much different than all the other products I have tried. I was wrong. I have been using this for three weeks now, and I can honestly say I see a difference. My lines are not as deep, my skin is very smooth, my pores seem to be shrinking, and my makeup goes on well. I am very happy with this product and would recommend giving it a try. I have tried many different products. I purchased over $300 in skin care at the dermatologist just a few month ago and was not as pleased as I am with South Beach Skin Lab cream. Write a Review for Release & Repair Cream by South Beach Skin Lab!